The special feature episodes of MBC drama The Moon that Embraces the Sun were getting ratings at high altitude. According to AGB Nielson media research agency on March 12th, 2012, the episode 1 of The Moon that Embraces the Sun special feature broadcast on March 7th, 2012 was ranking second among all programs broadcast from March 5th, 2012 to March 11th, 2012 with the rating of 24.5%. Moreover, the 2nd episode of special feature for The Moon Embracing the Sun ranked at 8th position with the rating of 19.2%, still manage to list on the weekly ratings ranking chart. Because of the PD Kim Do Hoon decision to join the strike, the actual episodes were postponed, replacing the special feature episodes. Although the ratings suffered a huge drop, but the results are gratifying. And a number of favorable factors have been shown from the ratings of special feature episodes, thus the ratings for the final last 2 episodes are showing a good trend. Actually, a lot of extra video footages, behind the scenes and interviews are attracting point, but they’re not been aired. Instead, the special feature episodes let audience watched the edited replay of The Moon that Embraces the Sun right before the drama ended. So the drop of ratings is reasonable. But from the ratings that it managed to score, the last episodes may still be popular. The Moon that Embraces the Sun ends on March 14 and March 15, 2012. The grand finale has getting a lot of anticipation. A lot of fans have been waiting for the ending impatiently, high ratings are highly anticipated. On the other hand, KBS2 TV weekend drama My Husbang Got a Family (You Who Rolled In Unexpectedly) took the crown of most popular TV program of the week with 29.8% rating, followed by The Moon that Embraces the Sun special feature episode 1 with 24.5% rating. 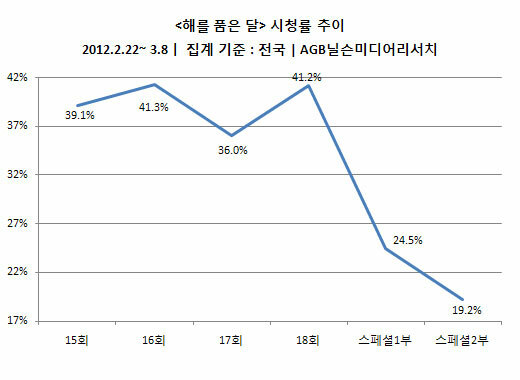 KBS2 TV’s Gag Concert ranked 3rd with 22.2% rating, which is also the first position for entertainment and variety show. Ranked 4th is Just You (My One and Only) of KBS1 TV which got the rating of 21.6%. KBS2 TV’s Happy Sunday ranked 5th with 20% rating, SBS’s Monday and Tuesday drama Salaryman Cho Han Ji ranked 6th with 19.8% rating, KBS1’s 9pm News ranked 7th with 19.4% rating. MBC’s The Moon Embracing the Sun special feature episode 2 ranked 8th with 19.2% rating, SBS weekend drama If Tomorrow Comes ranked 9th with 18.7% rating, while MBC’s Lights and Shadows ranked 10th with 17% rating.